Discussion in 'Coventry City General Chat' started by Rich, Apr 13, 2019. Shame for the lad. He must have something about him to have been close for so long. Be interesting to see where he turns up next. Confirmed? He had a trial at mk Dons which didn't work out. Can't see it but if that's the case give him a 10 year contract. Seemed to be an entitlement complex there with him (and certain family members) post debut/Stoke interest. A cautionary tale for aspiring youngsters. Parents with stars or is it pound signs in their eyes!! My friend is chairman of a team in the Evo-stick Premier, and who feed players in and out of Crewe.on a regular basis (Westwood. who later played for Villa appeared for them). He says that the problem they have at their level is with pushy parents of players who have not quite made it, but are 19-21 years old, so on the cusp of failing at the thing their child has set their heart on for 10 years or more. They still hope that they can get into League 1 or 2, and then their child will be noticed. Mocking a kid being released. High class that is. The shame comment you’re replying to, I think, is based on how a potentially decent player has let his attitude get the better of him. I’m pretty sure it’s nothing to revel in. No, he didn’t. That’s his problem, not yours. No need to apparently take pleasure from it. Oh Jesus. Sure you couldn’t. Wasn't he involved in a drink drive incident of some kind? sw88, Rich and Nick like this. Or just a family of proud City fans as he is. As a player I look at Camwell and I am reminded of Ryan Haynes, technically very good going forward, but susceptible when defending, McCallum and Mason are much better overall than Camwell. 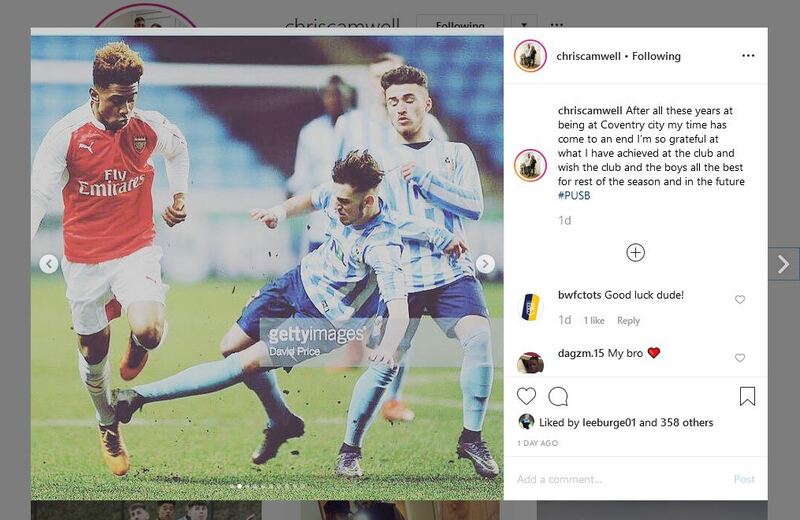 I’ve seen that the players family has been vocal in the past on social media stating how Camwell should be playing more and maybe the lad has lost his way? He’s had injuries too so perhaps it’s a combination of things. Good luck to him elsewhere if Camwell can improve defensively he will be a decent LB. Adge and Terry_dactyl like this. I’m friends with Chris and his family and your comment could not be further from the truth. He just wants to play regular football and if he’s not getting it with us then it’s only natural he will look to play elsewhere. If that means dropping down a couple of levels then so be it. Leamington Pete, Pete in Portugal, Somerset Sky Blue and 5 others like this. Gotta feel for the lad to be fair. Robins raved about his debut in League One and didn't follow up on it. He raved about his performance against Arsenal and didn't follow up on it. Don't think he's spoke about any youth player as highly as he did of Camwell. He also spoke to the Telegraph about Camwell being contracted up to 2021 when it came out he was on trial at MK Dons which proves how little he knows about his own players. Seemed a little strange Robins demanded a fee from MK and insisted they wouldn't let him go for nothing only to let him go for nothing. Also when Robins persuaded Chris to sign a new contract because he said Haynes was off only for Haynes to also sign a new contract took the piss a bit. Made the lad empty promises then left him out of the initial pre-season squad to Spain. You're right. I'd forgotten about that. Maybe Haynes was off and then things changed? Every time I read something about this lad on here it kind of feels him and his supporters feel like he was "owed soemthing". Apologies if I'm misreading it but that's just the way it comes across. Blaming others for him not being able to break into the first team seems a bit short sighted to me. Good luck to him wherever he ends up. oucho and skybluegod like this. He didn't rave about the Arsenal performance, he said he had good technique and was good in possession, but needed to work on a lot of things. He also has Sam McCallum coming through who is a much bigger talent. The telegraph claimed he is contracted until 2021 not Robins.